We are advised that when life gives us lemons, we should make lemonade, and that when life gives us limes, we should make a gin and tonic. But sometimes we're just so sad - so sad - so sad. It's hard to summon the strength - and the chirpy cheeriness - to do anything at all positive about the situation. The situation, in fact, is so terrible that we feel we would dishonor its tragedy by even trying to rouse ourselves to go forward. We just want to lie amidst the ruins of what once was our life, cursing the universe and sobbing. Some of this is good and right and necessary. I've done my share of sobbing over the past couple of weeks, as my husband, diagnosed with advanced Parkinson's last year, has continued to decline in strength and mobility. A week ago, after several 911 calls in succession to pick him up off the floor after a fall, and his near-total inability to get off the couch at all without professional assistance, he ended up in the hospital. Now he's in a rehab center for a week? or two? or three? Seeing if he can regain the ability to function enough to move back home - or ?? What will the future be for him? What will the future be for me? What will the future be for us? The rehab center is about half an hour's drive from home, and I go there every day, so this whole episode in our lives is not only heartbreaking, but time-consuming. This month I'm also teaching an online course for the graduate program in children's literature at Hollins University in Roanoke, and working with three aspiring writers through the mentoring program sponsored by the Society of Children's Book Writers and Illustrators, and writing a book of my own under contract (my most challenging title yet - the book set in a coding camp for kids, where I know - or at least initially knew - nothing whatsoever about coding). I can't just give up on these projects. And I don't want to. This current heartbreaking situation is not one that is going away any time soon. This is not a sprint. It's not even a marathon. It's the way my life is going to be for the foreseeable future. Somehow I HAVE to find a way to go on living - and working - and even (dare I say) being happy. So the other day, I packed up a tote bag filled with all kinds of tantalizing and delicious work projects: a book to read for my class, my laptop so I could respond to my students' delightful posts on last week's reading, mentee manuscripts to review, my clipboard and pad of paper and favorite pen for scribbling notes for Chapter 3 of my book. When my sister and I were growing up, one of our favorite ways to spend a day was with what we called "Personal Business." 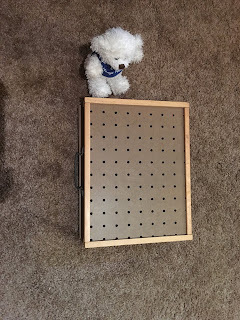 We each had a pegboard box: a rectangular box with a sliding wooden lid marked with holes where you could insert colored pegs. We had long lost the pegs, but the boxes remained. We'd fill them up with a book to read, a poem to write, homework to do, a potholder to weave with those little cloth loops on a little metal frame. Then we'd get into our beds, each with our Personal Business, and work side by side. This cherished pegboard box, alas, is too small to hold all my current work projects. 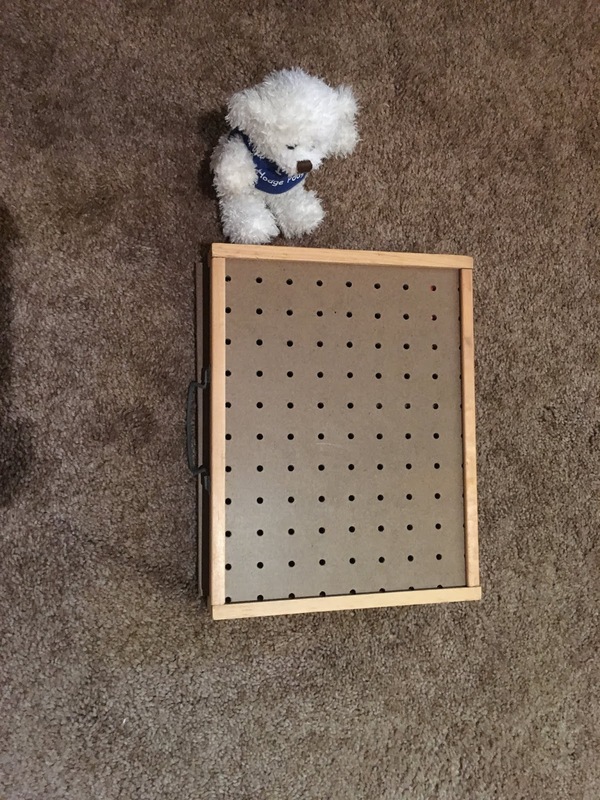 But as I packed them up to take to the rehab center, I suddenly remembered the pegboard days. I would spend a morning doing Personal Business as I visited Rich at the Powerback rehab center! And so I did. 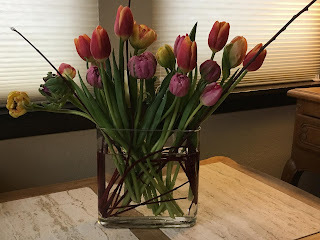 As Rich lay in bed, watching TV, dozing a bit, or was wheeled off to physical or occupational therapy, I sat curled up in a nearby armchair, sending emails, reading for my class, and making some notes for my book. Of course, we also chatted - and laughed at old jokes and memories - and just kept each other company. My morning was productive - and cozy - and companionable - and comforting. My morning was . . . lovely. I still don't know what the future holds for him, or for me. But maybe . . . just maybe . . . it will be okay - in not a Plan B way, but a Plan Q or R or S or P way - for both of us. I'm slowly learning how to make the best of it, even if my favorite poet, Kay Ryan, gives a somewhat dim assessment of this project in one of my favorite of her poems (quoted in full in the New York Times review of her Pulitzer-winning collection also titled The Best of It.) Sometimes making the best of it turns out to be something beautiful. This past week I was scheduled to speak about my forthcoming book, Nixie Ness, Cooking Star, at the Mountains & Plains Independent Booksellers Association spring conference: I'd be one of twelve authors (including nine authors of "grownup" books) giving a five-minute pitch for my title at their "Author! Author"! dinner. I was thrilled that my publisher had arranged this opportunity for me. The only problem was that on the day of the conference a "cyclone-bomb-blizzard" was predicted, with driving winds and accumulating snow. I have mentioned before that after totaling my previous car on a slushy road two years ago, I do NOT drive in snow. Or like to be in the car when anyone else is driving in snow. To drive in a cyclone-bomb-blizzard was not an option. Missing the conference was not an option, either. Maybe the predicted snow would not materialize? Then my writer friend Kim Tomsic, who was also speaking at the booksellers' dinner, and I made a plan - a most excellent plan indeed. We would book a room at the hotel for that night! A sleepover!!!!! And we'd drive down to the hotel hours and hours ahead of the storm! Time to chat! Time to work! Time to lie on our beds!!!!! And so we did. The blizzard did turn out to be not so bad, so maybe we could have driven home that night. But wasn't it lovely not to have to worry about the weather at all? And to lie on those beds side by side, doing our own projects, while also exclaiming over how brilliant we were to have thought of such a splendid plan? Well, I love Kim, too. And I loved having a sleepover together. Sometimes making the best of it turns out to be best of all. I returned yesterday from one of the sweetest and proudest moments of my children's book writing career: accepting this year's Kerlan Award from the University of Minnesota Libraries. The Kerlan Collection (quoting from its website) is "one of the world's great children's literature archives. 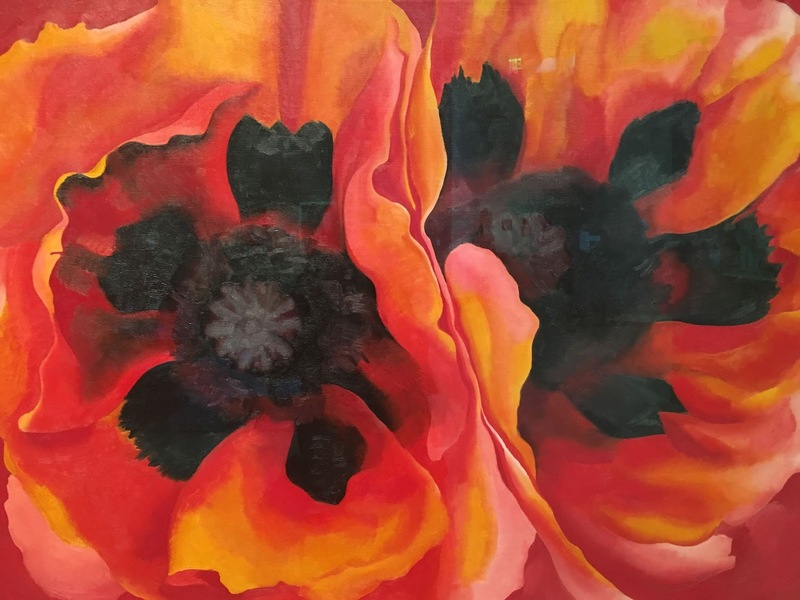 The Kerlan Collection contains more than 100,000 children's books as well as original manuscripts, artwork, galleys, and color proofs, and other production materials for 1,700 authors and illustrators." And one of those 1,700 authors and illustrators is me! I've been sending my handwritten manuscripts - and detailed handwritten notes - and marked-up typescripts - and critique group comments - and editorial letters - to the Kerlan Collection for decades. It's a thrill to me to think of the humble beginnings of each of my 56 published books to date being preserved there in the company of works by so many children's authors I revere. I've delighted in the Kerlan Collection as scholar as well as author. In May of 2017 I spent a blissful week there doing archival research on Maud Hart Lovelace, author of the Betsy-Tacy books, which I love beyond all other books ever written in the history of the world. So this week's trip was in every way a joy for me. 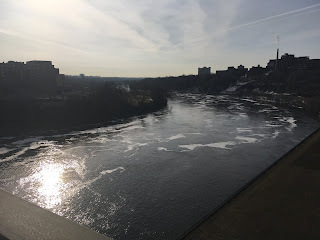 The University of Minnesota campus spans the mighty Mississippi River, so on the morning of my special day, I walked across the long bridge to savor the view. I had the whole day to myself, up until the evening awards ceremony, so I also toured the Weisman Art Museum designed by architect Frank Gehry. Of course I couldn't resist taking a picture of these gorgeous poppies by Georgia O'Keeffe. The universe kindly arranged for the award ceremony to take place while the Kerlan's absolutely stunning exhibit, The ABC of It, was on display. First shown in New York, the exhibit, curated by Leonard S. Marcus, was adapted by the Kerlan to showcase its stunning collection of materials from the history of children's literature. 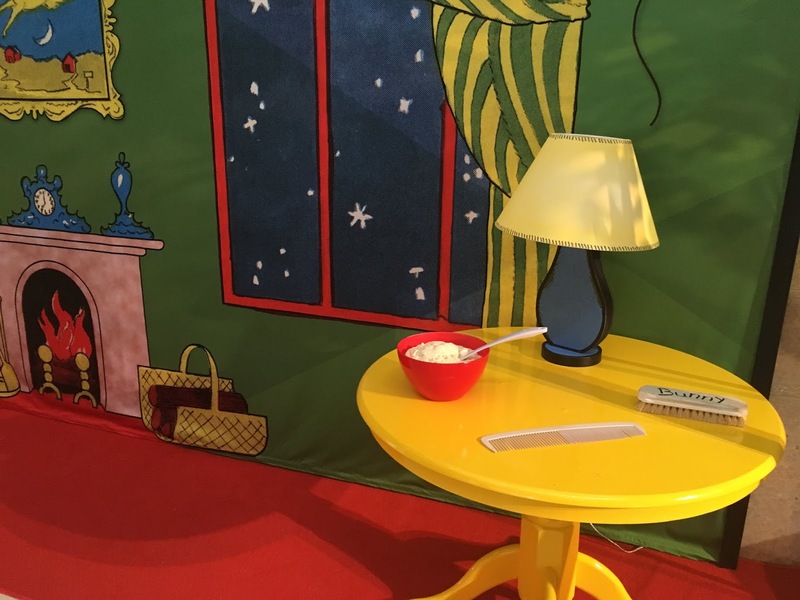 So I wandered by this replica of the Great Green Room of Goodnight Moon. 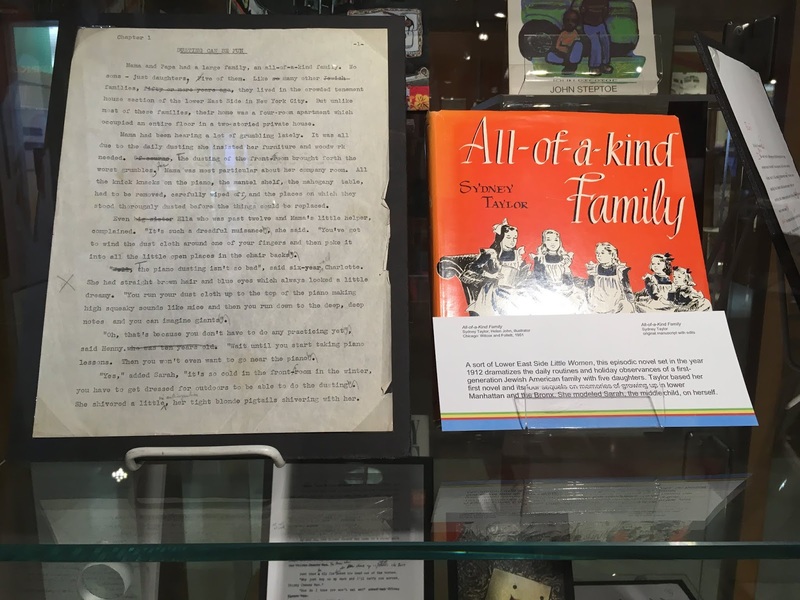 Every object on display took my breath away, but the one that meant most to me personally was the opening page of the manuscript of Sydney Taylor's All-of-a-Kind Family. There it was!! The trip was made even sweeter by the presence of one of my life's dearest friends, Rachel, and her soon-to-be-husband, Peter. They came to the awards event, and to the dinner the night before, and once the festivities were completed, we had time to play together in this beautiful city - visiting Minnehaha Falls (a site commemorated as well in the Betsy-Tacy series) and attending a fabulous production of one of my favorite plays, Cyrano de Bergerac, at the famed Guthrie Theater. I'm home now. The doorbell just rang, and it was flowers - for me! in celebration of my award! from my wonderful new publisher, Holiday House! I feel like a movie star! But mostly I just feel grateful: to the Kerlan for all it has contributed to the world of children's literature - and for an award given to me by an institution I so love and respect - and for a publisher who is so supportive - and for beloved friends who shared this moment with me this week. Thank you, thank, you, thank you! I spent most of this weekend at the second annual Children's Festival of Stories in Denver. Every minute of it was wonderful. Sometimes I wonder why I commit to attending events like this, where I spend hours and hours sitting at my little station, one of forty authors, all of us hoping to promote our books to the passersby. 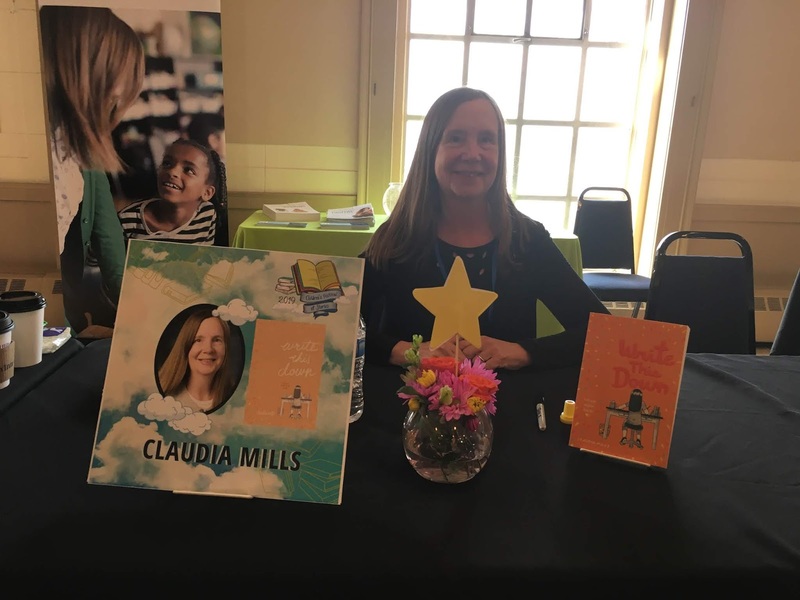 My featured book for the festival this year was my middle-grade novel Write This Down, targeted to ages eight to twelve; the average age of children attending such events is more like two to six. I knew I wouldn't sell very many books; I knew it wouldn't catapult me to fame and fortune. But the minute I got there I remembered - oh!!! oh!!!! oh!!!! I go to festivals like this because they are so joyous - a huge, energizing, inspirational, beautiful celebration of books and readers, and all the people involved in bringing the two together: authors, illustrators, editors, teachers, librarians, parents, and booksellers. I loved speaking on a panel to an audience of educators on Friday night, together with my brilliant fellow panelists Denise Vega, Laura Roettiger, Beth Anderson, Natasha Wing, and Abby Cooper. Here I am with Laura, both of us looking as smiley as can be. 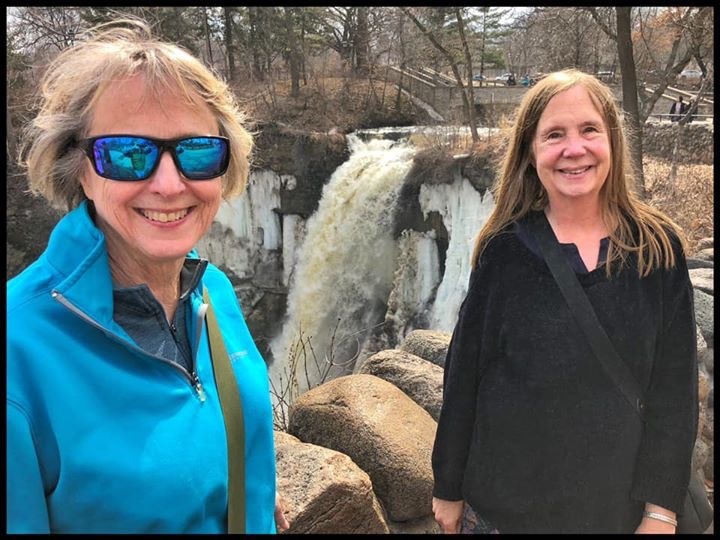 I loved seeing writer friends from afar whom I had met at previous festivals: Donna Gephart and Kate Milford (who became my friend just because we were seated in alphabetical order last time). I loved seeing beloved local writer friends like Jean Reidy, Kim Tomsic, and Melanie Crowder. Hugs, hugs, and more hugs! 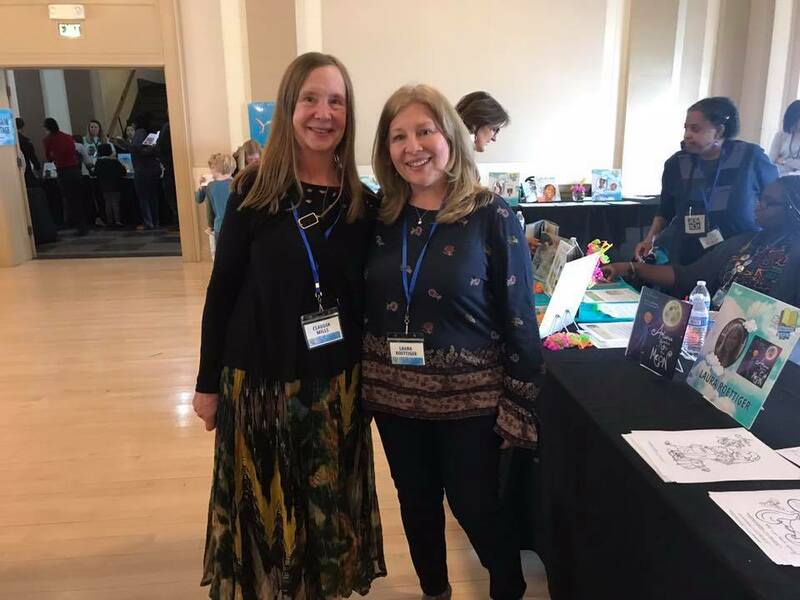 I fell in love with the author sharing my table at the festival: Alidis Vincente, attending from New Jersey - a fellow Jersey girl! I loved having children wander by my table and tell me they want to be writers, too. I loved their T-shirts, like the one that said "Bookmarks are for quitters." I loved having one of them tell me how much she had loved my book Kelsey Green, Reading Queen when she was younger. I loved staying in a hotel! My own room! My own bed! That gleaming shower! And having breakfast in the hotel restaurant sitting by the fireplace! Usually the part I do NOT love about festivals is seeing everyone else arrive with terrific displays for their table - or costumes! - or props! or adorable giveaways! or candy! - while I have none. I'm just so averse to self-promotion - and so averse to lugging stuff with me when I travel - just so averse to STUFF! So in the past, I'd look at THEIR huge amounts of stuff and get all, well, stuffy about it. Since when did writing become all about marketing, rather than simply making the best books possible? Count me out! But this time, just as I was starting to get stuffy - and huffy - and starchy - and sniffy - I thought, hmm, maybe it would be FUN to bring stuff? After all, the children attending adore getting and making stuff. My own granddaughters would adore getting and making stuff. Maybe it was time to say: Count me in! So I sat down at my bare little table (the flowers and bright yellow star and sign were provided by the festival, with not one speck of anything else provided by me). And I started to make a list of "swag" I could have next time. I won't present the list here, but it's a long one. And a good one. Most swaggy, indeed. I can do swag!! And next time I will! And come in costume, too! Just you wait and see! So yay for festivals. Yay for everything about them. 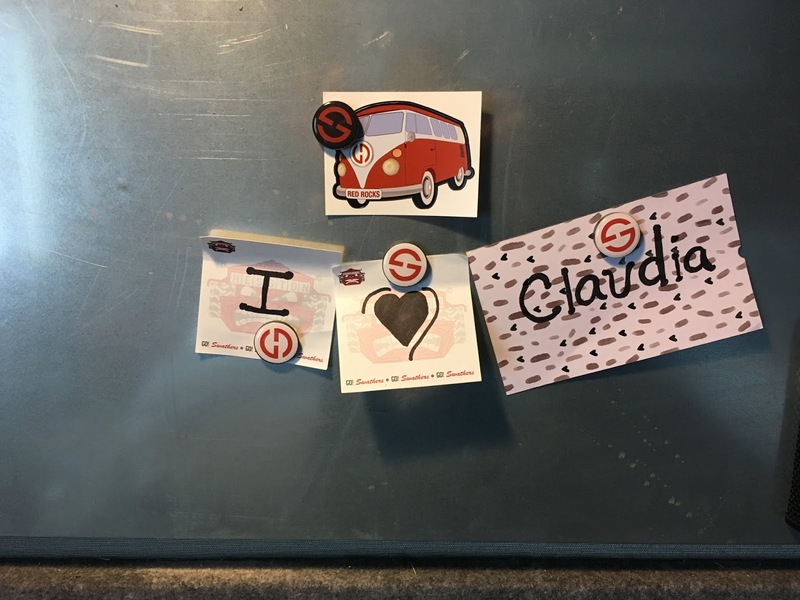 And yay for the chance to have even more fun at my swag-festooned booth at the next one. Here are the headings for some recent entries in my trusty little notebook where I record all my troubles and seek guidance - from the little notebook, of course - in facing them. How can I survive this season of sadness? I am still so sad - and so stuck! In reply, I filled two notebook pages with a list of all the ways that the problems in my life could be even worse. This left me strangely unconsoled. I made a list of ten fun, spirit-lifting things to do. I didn't feel like doing any of them. I made a list of twenty blessings - and I have to say it's a pretty staggering list. I might be the most fortunate person in the history of the world. And yet . . I was still spending every day doing Sudoku - my age-old vice - for hours on end, and pointless Internet searches for possible prizes I might have won that someone forgot to tell me about. Plus sleeping for eleven hours at night - why get up? Plus telling everybody who asked how listless and depressed I've been. Plus blogging about my blippettes, and their degrees of blippiness, making everyone else feel sorry for me, too. I HAVE to change this! "But nobody else is going to put it right for me. Nobody but me is going to change my story." LITTLE NOTEBOOK, HELP ME FIND THE WAY! And. . . it did. Though this is also the time to say that last week the little notebook told me to resume the anti-depressant medication that I gave up several months ago thinking I no longer needed it. The little notebook sent me to renew the prescription, and I did, and for a 90-day supply of Effexor (or its generic substitute), the grand total was. . . .$1.59!!!! For less than two cents a day I could feel less hopeless about everything in my life. So, dear friends, while medication doesn't work for everyone, if it does work for you, don't deny yourself this help. Please don't. I think the little notebook was able to help me work through my season of sadness largely because it first sent me to the pharmacy to get what I desperately needed. So here is what the little notebook told me this morning. And now I'm finally listening. 1. Start writing the book you need to be writing. MAKE THIS PRIORITY #1 IN YOUR LIFE RIGHT NOW. START IT TODAY. 2. No Sudoku ever! Delete the app from the I-Pad right now! 4. Allow yourself fun-filled outings, despite all the work you have. You do have time for this. In fact, you don't have time NOT to do this. 5. Stop telling yourself and everyone else how depressed you are. This isn't helping. 6. Review the blessing list daily. Commit it to memory. 7. Make a fierce, unshakable commitment to joy. I made this list and in the next two hours these things happened. A coincidence? I think not. After months of procrastination I sat down and wrote the first sentence - and then the first half of a page - for my new book. Nothing in my life has ever felt so good. I opened a card that came in the mail yesterday, and it contained a stunningly generous gift from anonymous "writer friends" to serve as "blip balm" for my recent small misfortunes. I will never ever forget the kindness of these friends as long as I live. A friend texted me to ask if I could join her for a funny play in Denver tonight - The Play That Goes Wrong - because her daughter can't use her ticket. I changed the sheets on the bed and did laundry. I opened the windows and let some warm spring sunshine waft its way into the room. As of this minute, I'm done with self-pity. Maybe not done forever - let's not make promises we can't keep - but for now. Last week was a bad week for me in the blippette department: 1) lost wallet; 2) precious package destroyed by the U.S. Post Office; 3) all my tax documents, en route to my tax-whiz sister, somehow sidetracked to a U.S. Post Office processing center in Palatine, Illinois, where they have languished for the past week; 4) water leaking from somewhere outside the house into the attic and down through the ceiling light fixture into the kitchen and dripping onto the kitchen table. But I am here to report that three out of these four blippettes turned out to be much less blippy than originally supposed. 1) It took me only three hours, all told, to replace the contents of the lost wallet. Lines at the DMV were remarkably short - indeed, there were no lines whatsoever. I walked right up to the counter and had my new license in fifteen minutes. And now I am set until 2024. Replacing my University of Colorado ID took longer, as it involved a walk across the sprawling campus, but hey, I like to walk. I was told I'd be charged $25 for the new ID, but instead I was charged just $5. Not so terrible! 2) I will mourn the loss of the precious package always. But there is a strange relief in realizing that nothing can be done about it, nothing at all, except to grieve. The Postal Service has identified a problem with the processing of this item at 4:07 pm on March 7, 2019 in PALATINE IL DISTRIBUTION CENTER. The local facility has been alerted and is taking steps to correct the problem. But I have come to realize that the needed steps are not indeed being taken, because they are so ridiculously easy that if they had been taken the problem would have been solved instantly: either mail the package on to my sister or mail the package back to me. So instead I've taken steps to replace the needed documents, which also turned out to be not that huge of a hassle at all, once I realized I had to do it. I was reminded of this line from my writer friend Laura Deal: "Activity is the antidote to anxiety." Now I am mildly amused by the daily texts from the Postal Service, rather than consumed with sick dread and impotent rage. 4) The roofer who installed the roof came to look at the leak, and it's NOT the roof that's leaking, it's some other problem with the gutters, and the heating cable that was supposed to be melting the ice in them but has failed. He has been extremely helpful and jolly in diagnosing the problem and figuring out to fix it. Oh, blippettes, you were, for the most part, so small after all, and yet I wasted so much time agonizing about you. Mark Twain is quoted as saying, "I've had a lot of worries in my life, most of which never happened." Well, my blippettes happened, but they turned out to be not so blippy, after all. I created the word "blippette" for problems that were too small to qualify as blips, but maybe I need a new word for problems that don't even qualify as blippettes: maybe just "ettes" - though I don't see that catching on. So I'll stick with "blippettes," but try to keep them in perspective (and hope that no new ones come my way in the coming week). How Many Blippettes Add Up to a Blip? Last week I lost my wallet. I decided to go on living, anyway. This was not even a blip, I declared. It was a mere blippette! Since then, however, blippettes have proliferated in my life at an alarming rate. I shipped a precious package, and its expensive and irreplaceable contents were lost in the mail; only the lid of the box was delivered, with a note from the U.S. Postal Service saying "WE CARE." I mailed all my W-2 and 1099 tax forms to my math-whiz sister in Indiana, who does my taxes each year for me. The post office tracking information reports that they are now languishing somewhere in Illinois. There was no mention of whether or not the U.S. Postal Service cares. 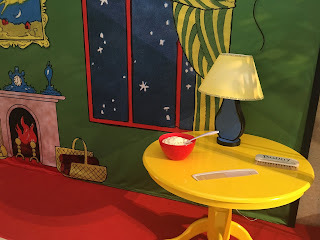 This morning my granddaughter noticed a steady drip-drip-drip of water from the lamp fixture over the kitchen table. Lamps do not generally drip water. Alas, the new roof installed with a zillion-year guarantee just a few years ago is leaking water from roof to attic, and from attic to light fixture to kitchen table. This is too many blippettes for one person in one week! Especially for a person, I might note, who also has her share of what anyone would say are real problems, too. So here is what I'm trying to remind myself today. Each of these annoyances, numerous as they have become, is nonetheless still a blippette. That said, blippettes do add up. However, when they add up, they are still only blips. Ahh, but don't blips themselves add up to something bigger? 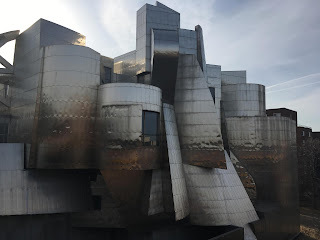 After all, enough trivial expenditures add up to a huge credit card bill; enough small savings deposits add up to a comfortable retirement.The whole premise of this blog - and of my entire writing career - is that a mere hour a day spent writing can add up to dozens of published books over the span of a lifetime. Little things add up to big things. That is an indisputable fact. But . . . this is another indisputable fact: while it is not up to me how much time these blippettes end up taking, or how much money they end up costing, it IS up to me how blippy I allow them to be. I can still decide to sigh and shrug and then remember that other people on this earth have also had packages go astray in the mail. I am not the only human being ever to have a leaky roof. In fact, billions of people on this planet don't even have a roof to leak. I can decide how much psychic energy to give to bewailing even FOUR BLIPPETTES IN A SINGLE WEEK. This week my cumulative tally of blippettes has definitely amounted to a blip. But even a blip is not the end of the world, or even a reliable omen of the approaching end of the world. It's just a reason to eat a few extra handfuls of jelly beans and not one, not two, but three Russell Stover cream eggs, now on sale in the holiday aisle at King Soopers. I'm off to have the strawberry cream one now.